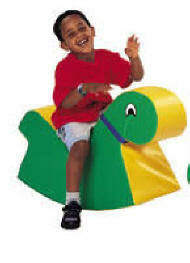 Sit and Ride-on Vinyl Soft Play Products - Vinyl Soft Play Sit-on and Ride-on Toys to Promote Active Play For Children 2 to 5 Years of Age. We offer vinyl soft play sit-on and ride-on toys for Pre-School Age Children to promote active play for children 0 to 3 years of age. Made of dense virgin polyurethane foam that meets all US and European Flammability requirements, they are a new advance in rocky toys, with no hard edges and a cantilever base for wide support. The solid foam core is covered in bright bold colors. All products are covered with bright 14 ounce Nylon Reinforced vinyl, Naugahyde Expanded Vinyl or 32 Ounce Coated Material chosen for the use and age of children intended for the soft play product. All covers are easy to clean and come with a 2 year warranty. Certified Greenguard Indoor Air Quality and Children and Schools Certification. Tested to preserve indoor air quality. Our floor play mats and activity mats are a perfect compliment to these soft play products - go to Play area Products - Floor Mats, Carpets and Floor Cushions. 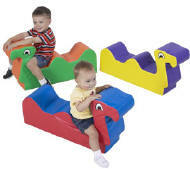 Soft race car shapes for 6 months thru 2s for crawling over, pulling up, around, toddling into, or just sitting. 10"h.
Three friendly romp 'n play friends. Little ones nest and play on our softly safe critters. 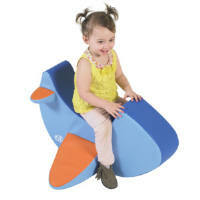 Two seats foster social interaction and turn taking. 33"l x 9"w x 7.5" saddle height. New advance in rocky toys. No hard edges. Solid foam core covered in bright bold colors. Cantilever base for wide support. 1" h seat.